This is for real, folks! 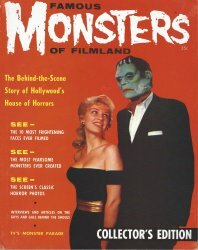 Famous Monsters of Filmland #1, a 50th anniver-scary reissue of the very first issue of FM (1958). This time printed with much better paper stock to live forever like our favorite film monsters! Collectors know that a "fair" copy of the original #1 goes for more than $250, with top quality copies going for much, much more. So, what's different with this reissue? As mentioned, the paper stock is much improved. Photos and terror-ific text are glossy and jump off the pages like never before! The only other difference is a small line of text at the bottom of page 66, declaring this is "Famous Monsters of Filmland No.1: 50th Anniversary Commemorative Special Edition. Printed in U.S.A. December 2007." Photo below is of an actual copy of this historic reissue! Grab yours today before they're gone for good. Collector's Note: These magazines are new and never circulated. We would give our remaining copies a grade of Fine because the covers show light scuffing and/or a bent or dinged corner caused in shipping to us from the publisher. View the images closely of the front and back covers as these are scans of a representative copy of the remaining copies in stock.